We had BarCamp at work. BarCamp, you say? Wikipedia begins to define it as an 'unconference', but that was where the similarity ended. Normally, a BarCamp is about Information Technology professionals getting together and sharing their knowledge in an open communicative environment. When it comes to geeks (mostly unmarried) and communications it means - Laptops, Wi-Fi, Blogs, Wikis, Coding, Sleeping Bags and so on. However in our building we have more librarians then techies. There was basically an open schedule board, where participants could sign up to give a presentation, or be a moderator. In this case, no topic was off-topic. The schedule was to be finalised, hardly 5 minute before the event. 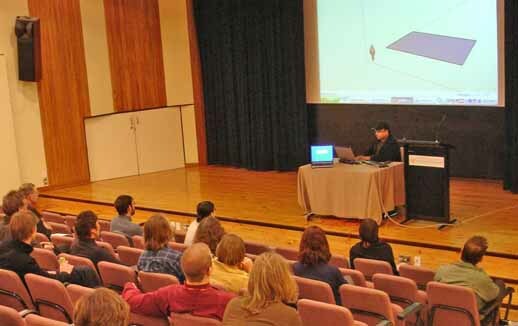 It was planned that each session, the presenter had a few minutes to showcase his/her idea and then the audience joins into a discussion. Of course, depending on the topic there were variations. I moderated a couple of very significant sessions, presented by a fellow techie colleague related to hotdesking with terminals and remote access to office applications. There was a lot of interest from the audience/participants in what's-in-it-for-us fashion. In my turn, I presented a unprepared session (in the spirit of the un-conference) on Google Earth and our interest there (picture below). I gave a demo in 3-dimensional modeling in Google Sketchup, attempting to show how easy it is. I also presented a few ready-made models from Google's 3D Warehouse such as the Taj Mahal and Eiffel Tower. I was taken aback to notice that our CEO was also in the audience - she asked some very good questions related to importing of CAD drawings into Sketchup software. Everybody was interested in the technology and wanted to know more on how to get into this and what was required to contribute. Overall, the event generated a lot of involvement, buzz and energy - above normal levels. I enjoyed playing the roles of organising team member, moderator and presenter.There's a plan to follow up with a similar and longer event in a month or so. It is really cool, I did not know actualy one can do a 3D modeling in Google. Keep it up.